We wish concussions weren’t a problem, but they are, and at all ages and levels of play. The CDC estimates that 1.6-3.8 million sports and recreation-related concussions occur each year in the United States. Children and teens are at the highest risk. Head Case Company found that 1 in 5 high school athletes will sustain a sports concussion during the season and 33% of high school athletes who have a sports concussion report two or more in the same year. Unfortunately, most people aren’t familiar with the symptoms of concussions. Even those who are at the most risk. It’s not too late to learn! Make sure all coaches, officials, parents, and players are will educated about concussions. Prevent injuries with proper technique. Be aware of the symptoms. Know when to sit out. Once training is complete, coaches will receive a certificate by email. With a few clicks they can forward that document to you, making it easy to keep track of which coaches have learned the fundamentals of concussion awareness. You’re in luck! Melinda Roalstad, MS, PAC and Wain Allen, MD of Think Head First have shared their answers to commonly asked questions about concussions. What are some common symptoms following a concussion? Although symptoms of a concussion are not always definite, they can include changes to physical, cognitive/mental, or emotional functioning. For example: problems with headache, neckache, backache, dizziness, nausea, memory difficulties, poor concentration, irritability, anxiety, depression or sleep difficulties. No. A concussion typically involves at least a change in behavior or alteration of consciousness of some sort, but an actual loss of consciousness is not required for the diagnosis of concussion. Often times, an athlete may be unsure of whether a loss of consciousness has occurred during a contact incident and post concussive symptoms may arise following multiple sub-concussive blows that occur in close proximity of time. Many factors influence the course of recovery from a concussion, including the severity of the concussion, previous history of concussion, physical injury/pain symptoms, and personal history…Most healthy athletes, however, will see significant improvement within 7 to 30 days following their concussion. When is it necessary to see a doctor following a concussion? Early detection and treatment of concussion is the best with regard to recovery and prevention of future problems. Many times symptoms do not arise initially and any worsening symptoms warrant medical evaluation. Therefore, if you have sustained a loss of consciousness, or any significant duration of change or alteration in consciousness (e.g., more than 10-15 minutes), severe headache/seizure activity, repeated vomiting, trouble walking/talking, neck pain all indicate it might be a good idea to see a doctor familiar with diagnosing and treating postconcussive problems. In any case, lingering problems following a concussion should be considered a signal that you should consult a professional. I am recovering from the effects of a concussion. What can I do to help with my recovery? Initially, appropriate rest is the most important; rest from all physical/mental/visual stimuli is most helpful for energy conservation and replacement for recovery. Decreased time with technology, reduced daily demands and stress reduction all contribute to the recovery process. Mindfulness meditation assist in calming the brain to facilitate recovery as well. Definitely avoid return to sport when injured. If symptoms persist despite appropriate rest, then consultation with a concussion specialist is recommended. Restriction from play, and the passage of time go a long way towards full recovery. In some cases, however, various associated problems following a concussion may serve to prolong the effects of a concussion if they are not detected and treated properly. Looking for more in-depth information about sports-related concussions? Think Head First provides other great resources for sports teams, such as their About Concussions and Acute Injury Handouts! IOM and the National Research Council released a report in late 2013 exploring some of the unknown facts about concussions. Read the full report online. Or skim the Report Brief in PDF or HTML. 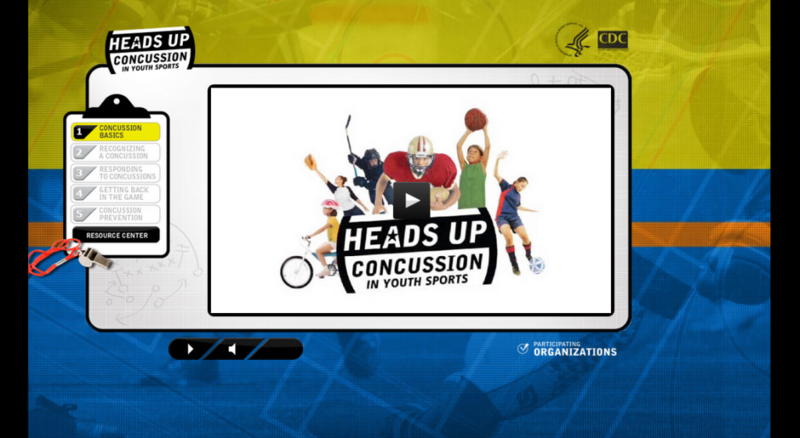 ★ Your league’s governing body may be a part of the National Sports Concussion Coalition! It now includes: US Youth Soccer, USA Basketball, ASA Softball, Pop Warner, National Council of Youth Sports, USA Hockey, US Lacrosse, and USA Football.